Democrat Chad Taylor listens to arguments before the Kansas Supreme Court on Tuesday in his petition to remove his name from the ballot after he withdrew from the U.S. Senate race. Another day and another uptick in the odds that Democrats keep control of the Senate this November. The latest FiveThirtyEight forecast gives Democrats a 47 percent chance of keeping at least 50 seats. Republican chances of winning a majority have dropped from 64 percent when the FiveThirtyEight model launched two weeks ago to 53 percent Tuesday. The biggest mover Tuesday: Kansas. A new Public Policy Polling (PPP) survey put independent Greg Orman ahead of Republican Sen. Pat Roberts 41 percent to 34 percent. Democrat Chad Taylor, who has suspended his campaign and is appealing to the Kansas Supreme Court to remove his name from the ballot, came in at 6 percent. It’s the second poll in a week to have Orman ahead, though the previous one had Orman up by only 1 percentage point. The Kansas race is still volatile. Besides the question of whether Taylor will be on the ballot, Republicans are only now waking up to the fact that they have a competitive race on their hands. In the polls released since Taylor dropped out, Orman has garnered an unusually large — 25 percent to 30 percent — share of the Republican vote. That could change. Yet, Kansas is part of an unnerving trend for the GOP; Tuesday was the latest in a string of bad polling days for Republicans. A PPP poll released Tuesday in North Carolina gave Democratic Sen. Kay Hagan a 44 percent to 40 percent lead over Republican Thom Tillis. Just a week ago, Hagan had no better than a 50 percent chance of winning, but PPP is the fifth pollster to release a survey in the past week that has her up by at least 3 percentage points. Hagan is now a 70 percent favorite. Why have Democrats been moving the ball? It’s not the national environment, which favors Republicans. And many less competitive races haven’t moved one way or another. On Monday, my colleague Nate Silver suggested one theory: Democrats have been out-fundraising Republicans by a substantial margin in many of the most competitive races. The Cook Political Report’s Charlie Cook noted in a column Monday that Republicans are worried mega donors on the right are not opening their wallets to the degree they did during 2012 campaign. And a new report released by Wesleyan Media Project, using data from Kantar Media/CMAG, reinforces Nate’s hypotheses. Democratic Senate candidates and the outside groups supporting them have enjoyed advertising edges in almost all the competitive Senate contests over the past few weeks. Three of their larger advertising leads have been in Colorado, Michigan and North Carolina — the three states where we’ve seen the biggest movements toward Democratic candidates in the FiveThirtyEight forecasts. 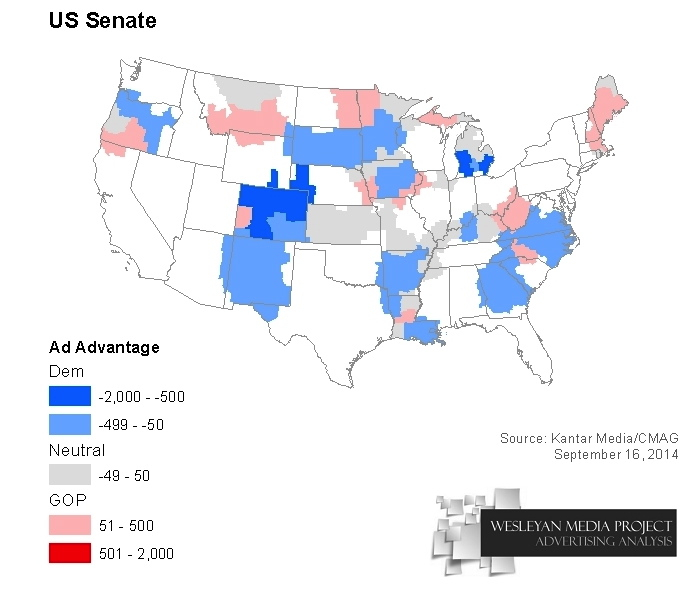 New Hampshire, one of the few competitive states to move toward the GOP over the last week, is also one of the few states where Republicans have had an advertising advantage. It’s important not to oversell this point. Democrats also have large advertising advantages in states where the polls don’t look so good for them, including Georgia. And the raw number of ads each side is airing is less important than what time the ads are on, because people are more likely to be watching television at some times than others. Still, it’s clear that Democrats are dominating the airwaves. The question is whether Republicans and their affiliated groups can catch up. If they can, then we may see a reversion to the mean, and the Republicans’ more robust position might be restored. If Democrats maintain their lead on the air — and if that edge is what’s driving the Democratic run over the past few days — then they might able to overcome a bad national environment.